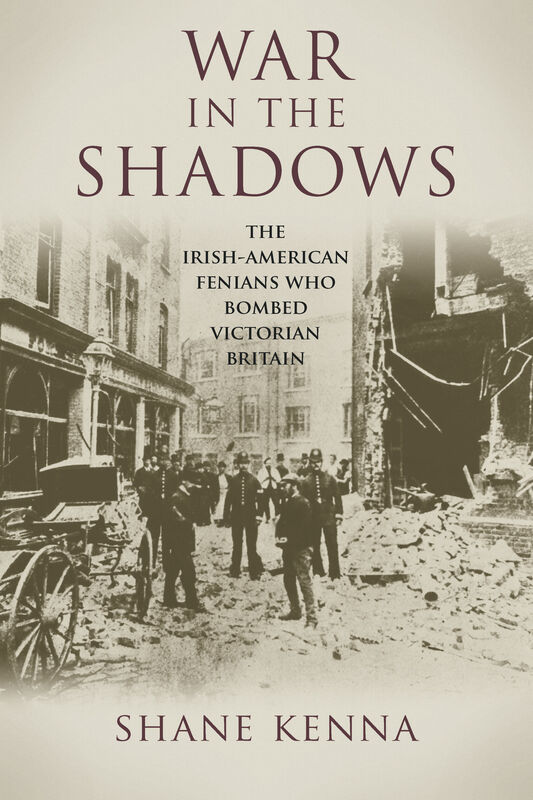 ‘War in the Shadows’ is an investigation into the workings of the Irish-American attempts to bomb Victorian Britain during the campaign of 1881-1885, focusing in particular on the influence of Clan na nGael and their relationship with the Irish Republican Brotherhood. Throughout this fascinating and comprehensive study by Shane Kenna it is possible to draw interesting parallels between late 19th Century Ireland and our own 21st Century world, including the increasingly globalised nature of Victorian society as well as the fear caused by the new tool of ‘terrorism’ by militant revolutionaries. In ‘War in the Shadows’ Kenna also traces the emergence of the British Secret Service, which was formed to undermine the Fenian dynamiters. Kenna opens his introduction with the bold statement that ‘Fenianism is widely regarded as the greatest and most influential revolutionary tradition in Ireland’s history’. Through use of pertinent and detailed case studies he presents a convincing argument for the influence of Fenianism throughout the 19th and 20th century on Irish nationalism. In modern parlance, the Fenian dynamite campaign was strategic terrorism. However Kenna argues against the use of the term. ‘Terrorism’, the now almost a taboo word, is confronted by Kenna in his first paragraphs, stating that it is inappropriate in reference to the Fenian bombing campaigns, and will henceforth referring to it as a ‘conflict’ of ‘considered, sustained and direct violence seeking to debilitate Britain’. Nonetheless, the Fenians strategy of targeting ordinary citizens, rather than the contemporary tradition of targeting political elites, led to a widespread ‘moral panic’ whereby people feared for themselves and their way of life. The links between this and, for instance, the bombings of the London tube in 2005 are not difficult to draw. Fenianism was an underlining commitment to the establishment of an independent Irish republic through the use of physical force. It is mainly associated with the Irish Republican Brotherhood (IRB), successor to movements such as the United Irishmen of the 1790s and the Young Irelanders of the 1840s.A definitive history of the Fenian bombing campaign of the late 19th Century is difficult to write, given the nature of the conflict itself. The campaign was a bloody, secretive mess, some of the whimsical and at times absurd cases that Kenna reports on sound like they could come straight out of a spy comic book. An eclectic cast of colourful, slippery characters and James Bond-esque conspiracies makes up the main body of ‘War in the Shadows’. Kenna demonstrates that the impetus for the campaign was more Irish American than Irish, focusing on Clan na Gael and its core group of conspirators known as ‘The Skirmishers’. Generated by Irish-American hatred of British rule in Ireland, these men were second generation Irish, most of whom had never stepped foot on Irish soil, but were as ardent as any native Irishman. Their parents, frustrated by the poor governing of their nation by Britain had been forced to emigrate. An illustration of Fenian bombs in London. In post Civil-War America, they were again frustrated by the post-war socio-economic depression. The ‘Skirmishers’ under Jeremiah O’Donovan Rossa, were a splinter group from Clan na Gael. The book portrays a hotbed of espionage, agent provocateurs, informants and spies, oaths and codes, reprisals and retributions. To a modern reader it seems surprising just how easy it was to procure large quantities of materials necessary to make home-made explosives. One man named Featherstone often visited the same chemists over and over to procure nitric acid for his ‘meat preservation patent’. Another interesting character was the dangerous Irish-American Fenian, Alexander Sullivan, described by Irish MP William O’Brien as ‘strong jawed about whose bloodless lips and sharp white teeth, there played a certain pitilessness’. In December 1868 Sullivan burned down his own shoe shop in order to commit insurance fraud. He was tried in a police court but found not guilty. In 1876, after moving to Chicago he fatally shot Frank Hanfor, the principal at his wife Margaret’s school, for questioning her honour. Sullivan was tried twice but acquitted on both occasions. Eventually joining Clan na Gael, he rose quickly in the ranks and built up a band allies including the influential Chicago Archbishop Patrick Feehan. After the Phoenix Park assassination, many Invincibles fled to America and were heavily influenced by Sullivan. These included Patrick Tynan, the famed supposed Number 1 of the Invincibles conspiracy. Outside British jurisdiction none of these men could be arrested and deportation was unlikely and legally difficult. Clan an Gael and the IRB established a Revolutionary Directory (RD) a body which had the power to declare war against Britain on behalf of the Irish nation (made up of three Clan na Gael members and three IRB men. Complete consensus was needed before the Directory could implement anything. Such agreement was inhibited by frequent infighting – mainly between O’Donovan Rossa and John Devoy, of the IRB Supreme Council. To overcome these divisions, the ‘New Departure’ under John Devoy, sought a reformulation of Irish politics by combining the ideals of the Fenians with the potential of the constitutional nationalists or Parnellites, thus uniting Irish nationalism. This was particularly strengthened during Parnell’s American tour from February 1880. In answer to the ongoing land agitation in Ireland, in January 1881 a truly a draconian policy for Ireland’s pacification was introduced by Chief Secretary William Foster. Under this ‘Coercion Act’, Irish Party leader CS Parnell was arrested in October. Reacting to the arrest the Irish National Invincibles, who would form the nucleus of an assassination squad, was formed within the ranks of the IRB. On 6 May 1882, in Dublin’s Phoenix Park Lord Frederick Cavendish and Thomas Henry Burke, the most senior civil servant in Dublin, were stabbed to death in broad daylight by the Invincibles. The attack was prompted the establishment of the Irish Crimes Bill even more draconian than the last, which had the opposite effect on quelling violence. 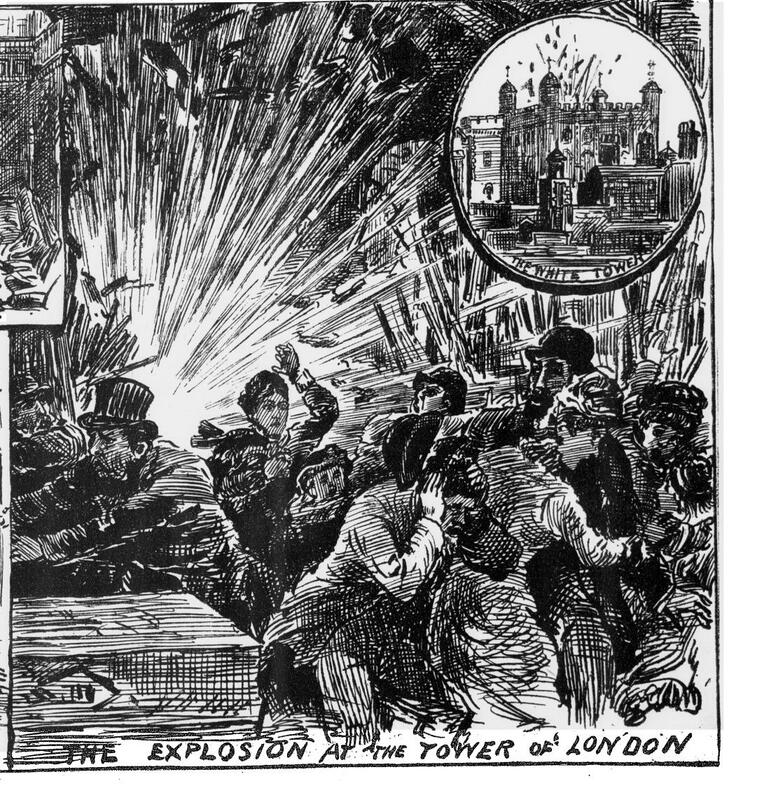 The high point in the dynamite campaign was a bomb was exploded on 30 October 1883 on a train at Praed Street in London, in which seventy-two people were injured. The Fenian dynamiters had targeted infrastructure in order to disrupt daily life and undermine the public’s confidence and had succeeded in causing widespread anxiety a significant fall in the amount of people using the underground. Following the bombing the Home Office established the Special Investigation Branch (SIB) within Scotland Yard. The SIB was established in direct response to the experience of Fenian bombings following the Whitehall explosion in March 1883. The body was seen as illiberal, non-transparent and contrary to liberal Victorian values. The detective unit would therefore not outlast the Fenian bombing threat. While a secret police body like Special Branch could exist in Ireland itself, the Home Office understood that it could not exist in England. In Ireland, a permanent secret service department: the Crime Special Branch, was set up led by an ‘Assistant Under-Secretary for Police and Crime’ Edward George Jenkinson. The year 1884 saw an aggressive expansion in the Fenian experience of bombings; with explosions in railway stations, rumours of assassination plots, coupled with the humiliating destruction of the Special Irish Branch headquarters at Scotland Yard. Jenkinson suggested a solution to Fenian ‘terrorism’ required bi-partisan agreement on Irish Home Rule in principle, appeasing the moderate nationalists while marginalising the extremists. There would be a selected Viceroy and a transitional government in Dublin Castle that would involve moderate nationalists in limited decision-making capacities, removing grievance against Britain and training the Irish in how to govern themselves. Jenkinson, the head of Special Branch in Ireland advocated a conciliatory political strategy towards Irish nationalists as well as a security response. However in practice until the British government succeeded in implementing Home Rule, Jenkinson’s security operations would have to continue unabated. On New Year’s Day 1886 the Conservative government unanimously rejected the Home Rule Bill, resulting in the resignation of Jenkinson, who insisted that Irish political violence needed a political as well as security solution. Nevertheless, his strategy did succeed in driving a wedge between different stands of Irish nationalism. A new constitution for the Clan was introduced by Alexander Sullivan, to protect the Fenian bombing in Britain. With it the leadership was reduced to a three man junta, called ‘The Triangle’ with Sullivan, Michael Boland and Denis Feely. Without the knowledge of the Supreme Council the Triangle now disassembled the Revolutionary Directory and cut off formal communication with Ireland. John O’Connor, acting member of the Supreme Council, was sent to Boston to meet with Boland. This secret and unrepresentative group, determined to continue the dynamite campaign, divided and weakened Irish nationalism, placing an irremovable wedge between physical and moral force tendencies. Moreover even after the removal of Jenkinson, those in favour of the dynamite campaign continued to be plagued by internal divisions. The infighting in Clan na Gael is a prime example of this. Its leaders were accused of neglecting the men they send out on dynamite campaigns and leaving their wives and widows destitute if their husbands fail to return. The Triangle was accused of embezzling $300,000 of funds. Clan na Gael, the organisation which had brought alarm and panic to the sentinel of the British Empire, would tear itself apart. The Irish-American Fenians who bombed Victorian Britain, rather than blast the British presence out of Ireland, had blasted the most powerful nationalist organisation asunder. Fenianism collapsed from within. The dynamite campaign had been a modern and innovative use of new weapons, but the movement was itself stagnant, always waiting on British difficulty to find an opportunity. The irregular and arbitrary use of violence was also a divisive factor across the Fenian movement, mainstream Fenianism was repulsed by this extremist strategy. This division was indicative of future splits and factions in the Irish Republican movement. Another interesting progression ‘War in the Shadows’ charts is the change in Victorian liberal ideals, which trusted in the policeman dressed in uniform parading the streets to be a sufficient deterrent to crime. This was not an appropriate way to deal with political conspiracy and terrorist attacks. Victorians viewed detective work and unprincipled informants as unconstitutional and degrading to the profession of policing. However during the Fenian dynamite campaign methods long used in Ireland – including covert intelligence gathering, systematic use of paid informers and so on – were imported to Britain itself. Finally it was determined that both intelligence and police led counter-Fenian strategy could only contain rather than defeat the movement. It was necessary to tackle it politically, this is why the Home Rule in principle was favoured to divide Irish nationalism. One thing that is lacking in this comprehensive study is an international comparison of Irish Fenianism with other militant revolutionary groups of the era, the most infamous of which being the assassination of Tsar Alexander II of Russia by the Narodnaya Volya (‘People’s Will’) in March 1880. Niall Whelahan’s The dynamiters: Irish nationalism and political violence in the wider world, 1867-1900’ published in late 2012, provides a broader context to the conflict, while also covering many of the same Irish case studies. Overall though, Shane Kenna’s War in the Shadows is a wonderfully readable treatment of 19th century political violence and radical nationalism in Ireland. Shane Kenna is writing the biography of Thomas McDonagh as part of the 16 Lives Series for the O’Brien Press. He is also currently working on Fenians in the Frame: A Photographic History of Ireland’s Revolutionary Underground for Irish Academic Press. It will be the first photographic history of the Fenian movement within Irish history. One Response to "Book Review: ‘War in the Shadows: The Irish-American Fenians who bombed Victorian Britain’"